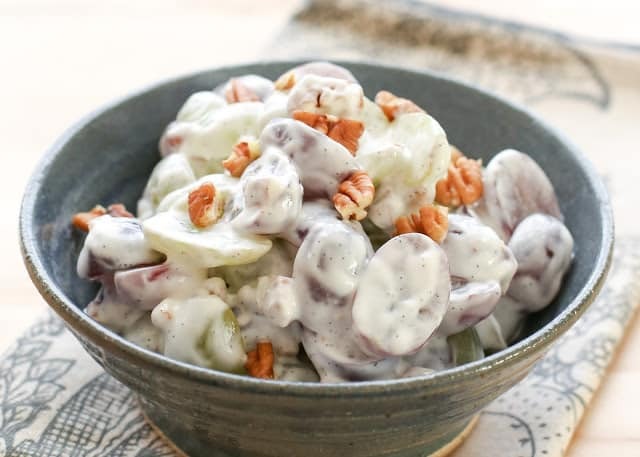 Sweet grapes, crunchy pecans, and vanilla bean sour cream are combined in this unexpected and delicious Grape Salad with Vanilla Bean Sweet Cream. My boys went nuts over this salad the first time I made it and I couldn’t stop eating bites of it myself. I’ve made this simple Grape Salad countless times and my youngest son can not get enough of it. Every time he sees grapes in the store or in our refrigerator, he asks if we can make “the really good grape salad” again. How could I ever say no to that? Grape Salad is a classic potluck and party dish in the south. If you’ve never had it before, this recipe is the perfect one to make first! 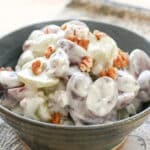 If your experiences with grape salad call to mind overly sweetened, gloppy dishes at family reunions or work picnics, I promise you this particular Grape Salad recipe is so good it will have you scraping the bowl and going back to the buffet table for seconds. This Grape Salad recipe is NOT your average grape salad. Years ago, we made versions of this salad with cool whip or vanilla pudding. They were fine but nothing spectacular so I wasn’t in any rush to make them again. I’ve also tasted grape salads made with yogurt or cream cheese based dressings. Again, they tasted okay but didn’t leave any big impression. I could take them or leave them, really. Then, I discovered fruit salads made with lightly sweetened sour cream. This grape salad uses this sour cream dressing and I’m happy to say that this salad trumps any other grape salads I’ve made hands down. Sour cream with just a touch of sugar is just the right amount of tangy and sweet to compliment the juicy grape flavor in this salad. I would happily eat this salad with breakfast, lunch, dinner or dessert. Several years ago, I tasted sweetened sour cream for the first time when I made a Layered Lemon Cheesecake. I was impressed by the difference a sprinkling of sugar made in the typically tangy (and sour) cream. If you haven’t tried lightly sweetened sour cream before, you’re in for a fun treat! I have served this salad to several people who were shocked that the creamy dressing was simply sour cream! There’s no big secret here. 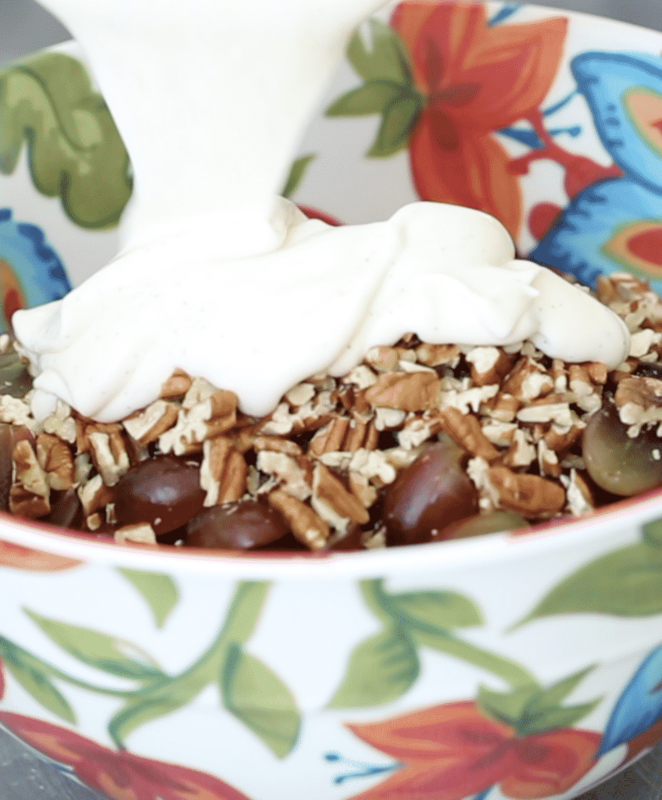 Just tasty fresh grapes and pecans covered in creamy, tangy, sweetened sour cream. Sometimes the simplest recipes really are the best! This salad recipe is such a tasty dish to bring to potlucks, picnics and gatherings. It’s also perfect served with a nice sandwich or wrap for an easy family lunch. Grape Salad is an extremely easy no-hassle side dish. After mixing together sour cream, a little sugar, and fragrant vanilla, simply add a bunch of sliced green and red grapes to the bowl. 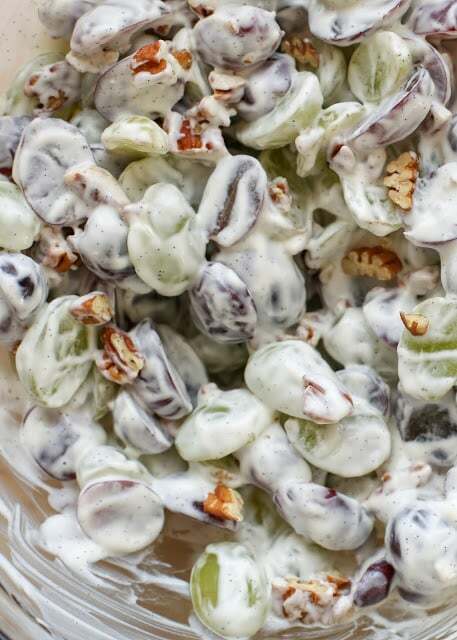 Throw in a generous handful of crunchy pecans with the grapes and sour cream dressing and you have a delicious, lightly sweetened dish that’s ready to serve. You can enjoy this Grape Salad right away or store it in the fridge. If you won’t be serving the salad within a couple of hours, wait to add the pecans until just before serving so they don’t get soft and mushy. If you want to make this recipe but only have one variety of grape in your fridge, go for it anyway! I like the combo of green and red grapes for the nice color and flavor variety it adds to the dish but it would also taste good using all green grapes or all red grapes. It goes without saying that you should use seedless grapes in this recipe if at all possible. We want the nice crunch in this salad to come from the pecans rather than from surprise seeds hiding in each juicy bite of grape. Seedless grapes are also easier to slice! Sugar adds sweetness but what really makes this sour cream fruit salad dressing sing is the addition of vanilla. You can use either fresh vanilla bean or real vanilla extract to add the vanilla flavor to the sour cream. Skyrocketing costs of vanilla lately and the difficulty of finding fresh vanilla beans in many grocery stores mean that I typically use vanilla extract when I make this recipe. It works just as well without as much fuss or expense. It’s easy and inexpensive to substitute vanilla extract for vanilla beans. One teaspoon of pure vanilla extract is roughly equivalent flavor and aroma wise to one vanilla bean. I know there are plenty of vanilla purists out there who argue that fresh vanilla bean is always the better option in baking and cooking. I can’t say I always agree. While fresh vanilla is amazing it’s simply not convenient or cost effective for most of us. The difference in quality of taste and flavor simply isn’t as significant as the difference in expense for me. Everyone has their own preference, though, and that’s why I say use whatever mode of vanilla flavor that’s best for you. If you happen to have a fresh vanilla bean lying around, definitely use it! I LOVE what it adds to this recipe, but for the rest of us, there’s our trusty vanilla extract. Both ways of adding the vanilla flavor are delicious and really enhance the taste of this Grape Salad. I haven’t tried using this vanilla sour cream dressing on many other fruit salads yet but I’m looking forward to experimenting with it on different combinations of fruit! It’s so creamy and light that I bet it would taste great on lots of other fruit salads. For more fruit salads that you’re sure to love all summer long, try our Pineapple Mojito Fruit Salad or the Balsamic Basil Berry Salad. This Berry Delicious Fruit Salad caught my eye earlier, along with this healthy variation on the classic Waldorf Fruit Salad. In a medium-size bowl, stir together the sour cream, sugar, and vanilla. Add the grapes and pecans to the bowl and stir to coat. In a medium size bowl, stir together the sour cream, sugar and vanilla. Add the grapes and pecans to the bowl and stir to coat. Serve immediately or chill until ready to serve. Enjoy! Hi Mary, what a wonderful salad, this will be a real crowd pleasure here in my home. Thanks! Oh my gosh, it sounds so good! I think I've had something like this before - but I need to have it again. Yum - I know it is tasty. The photos are amazing! Drooling! This sounds way better than a cool whip version. I can't get enough fruit salad and love having new versions to try! This sounds so deliciously summery!! I can't wait to put a bowl of this together. I wonder how it would be with vanilla Greek yogurt instead of sour cream -- plus the vanilla bean -- cause I LOVE vanilla? What do you think? This sounds like a perfect salad to add to the items I am taking to the in laws for Easter dinner. I am now torn between the sour cream and the suggestion by mmlssoucy of using vanilla Greek yogurt. Would you still use the same amount of sugar if I went with the yogurt? This was very yummy. Will make again. The vanilla cream would be great with all fruit. Thank you Mary for another great recipe. Is it possible to post the calories, fats, carbohydrates, etc. for all your recipes,? This isn't something I am able to do for the 1000+ recipes here on my site. 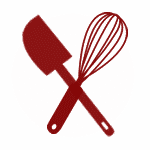 However, you can enter the ingredients into https://www.caloriecount.com/cc/recipe_analysis.php and it will calculate it for you.